In this article, we will give you the falafel restaurant in Tel Aviv, falafel restaurant in Jerusalem, and falafel restaurant in Eilat worth visiting, especially if you never had one before! Falafel is a vegetarian dish, which regularly comes in pita bread, or a Laffa bread, which is like a tortilla, but thicker, and the falafel itself is actually balls of chickpea(And some more good things), deep-fried and can be served as a whole meal in pita bread, or as side Deseret while eating other things. If you go around Israel, you can find places which makes falafel/ falafel restaurant almost everywhere, as falafel is not only easy to make and cheap, it is also considered one of the symbols of Israel and the Israeli food. Around Tel Aviv, you got so many falafel stands, You can enjoy your falafel with a great salad, and lots of tehini(טחינה) on the top. 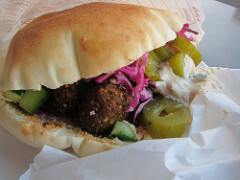 Do you have a falafel restaurant you like more in Tel Aviv? write it in the comments and everyone can enjoy your recommendation. In the Machane Yehuda area, try “FALAFEL HAACHIM LEVI”(פלאפל האחים לוי), Which is a well-known establishment, which is not exactly a restaurant as you can’t really sit, but the falafel is good! The other falafel restaurant is called “falafel shalom”, and has many branches around Jerusalem. This is a restaurant where you can sit if you like, and the falafel, among other things there, is awesome! (Enjoy your meal in Hebrew :)! Eilat is amazing, and a must-see place in Israel to have a good time and unwind, enjoying beaches, shopping and a lot of sun. If you want to enjoy a falafel in Eilat we recommend you check “FALAFEL BOUTIQUE”, which offers a falafel people in Eilat go to for ages now.